In Haṭhayoga हठयोग, we are going to use our body as a tool to perfect it and respectfully adapt it to the demands of the poses. 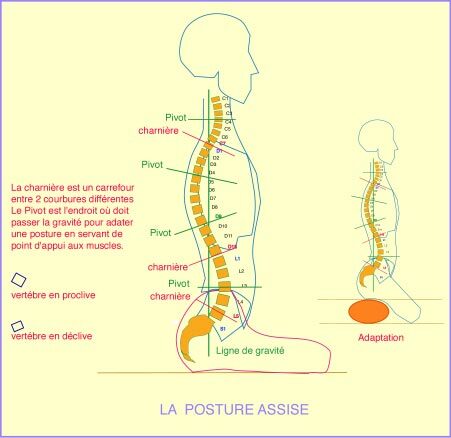 Whether in sitting positions of Prāṇāyāma प्राणायाम (breathing) and Dhyāna ध्यान (meditation), or in other Āsana आसन (poses), the vertebral axis will be used. Thanks to a better knowledge of his body’s architecture and of the mechanisms of postural balance, the yoga student will be in the right pose right away. Many people starting yoga have a lot of trouble sitting on the floor. state of the abdominal organs (bloated belly, stomach unease...). or lotus pose (Padmāsana पद्मासन) for the most flexible people. Many variants exist among these alternatives. We are not making a list here of all the sitting positions of Haṭhayoga हठयोग. The goal of the sitting pose, stability. Stability goes hand in hand with a straight back which enables the opening of the pelvis, the relaxation of the abdominal muscles, the opening of the rib cage and the free piston movement of the diaphragm. In other words, we should have a straight back, the shoulders rolled back, the rib cage opened, the pelvis in anteversion (pubis tilted forwards). By straightening up the back at this level (a little bit above the waist), we give a good support to the diaphragm (breathing muscle), which facilitates the opening of the rib cage and the correct positioning of the abdomen in the pelvis. By slightly arching the lower back (anterior pelvic tilt), we allow this vertebra to position itself naturally to ensure the stability of the whole spine above it, provided that the 3 supporting points are on the floor: ischium (and not tail bone) and knees (base triangle). The back becomes straight and dynamic and doesn’t slouch. It is positioned in such a way that it will be able to hold the exercises longer. Of course, energetic and firm back muscles and kidneys are necessary for this. If there is any weakness, tension or vertebral problem at this level, holding this position will be impossible. If we are unable to sit on the floor without a cushion with a straight back and the knees widely opened to the floor, it will be necessary to use a stable and square support (small folded blanket or flat cushion) to allow the forward tilt of the pelvis and to free up the hips. The height of this support will be adjusted by ensuring the necessary thickness so that the base triangle will be observed. Do not hesitate here to adjust the thickness accordingly. A good sitting position means a straight back. A straight back means a dynamic spine, which is at last ready to let the subtle energy gained from practicing prāṇa प्राण flow. 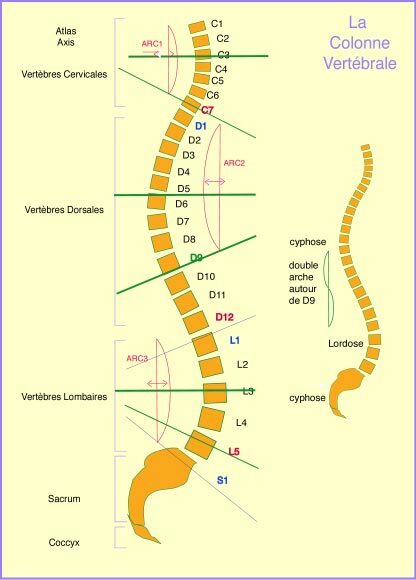 A dynamic spine will enable the awakening of śakti शक्ति. The practice of Bandha बन्ध will be easier. On a psychological point of view, it is a way of eliminating physical inertia and lifting the weight of worries off one’s shoulders. The study of an inversion, SARVĀṄGĀSANA सर्वाङ्गासन The analysis of the posture, its outfit, its anatomical and symbolic study. The Mudras The crowned gesture or the psychic seal.